PDFCreator is a simple tool for creating and managing PDF files and not only. PDFCreator is easy to use, it installs as a as a virtual printer that simply choose to print a document to generate the PDF file and allows the creation of files in most common formats: PNG, JPG, TIFF, BMP, PCX, PS, EPS. It works with any Windows application that allows printing. PDFCreator allows you to digitally sign your PDF to prove that you're the author and ensure that the document has not been modified. Finally, it is possible to encrypt files to prevent them from viewing or printing. PDFCreator offers many useful options to protect official documents in the working example. It can also be useful for compressing images of different formats which can add some fonts or adjust the resolution. It is used to prohibit printing a document and send a file containing confidential documents is possible without the person can neither change nor print. This is software also keeps on your pc encrypted sensitive data, that they will not be accessible even if the PC was hacked. It is possible more by automatically recording protect creating PDF documents . This is a simple to use, fast delivery and free software that is so fluid that it will weigh nothing on your system performance. * Implemented support for the new PDF Architect 2. 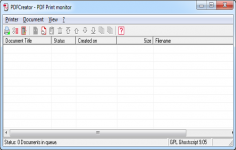 * Improved detection of printable files. * Fixed a problem when updating from versions <= 1.2.3. * Fixed a problem with downloading and installing additional language files. * Fixed a problem with pdf default settings "screen", "ebook" and "printer".